One thing that I have come to enjoy about Facebook, is finding so many blogs out there that are dedicated to the inspiration of the Christian. Just this week I became aware of GreaThings. Started in 2007, it has become a tradition that happens each November for two weeks before Thanksgiving. Starting November 8th through November 22nd, I have decided to give it a whirl. 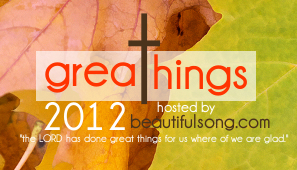 For any of you who would like to know more about this challenge, check out Great Things and Great Things 2012 Schedule. Each day I will add the new post to the list below! Nov. 10 – Scriptural Blessings! Nov. 15-20 – Catch Up..
Next Post Great memories and moments!